Misdemeanor Versus Felony DUI: What’s The Difference? While we all know that it’s illegal to drink and drive, many of us do it anyway. Some people drink too much at a party and think they are sober enough to drive home. Others are too embarrassed to call their family or friends for a ride home. Whatever the situation, if you are pulled over by a police officer and your blood alcohol content is at 0.08 or higher, you could be charged with drinking and driving. In Florida, a DUI charge is typically treated as a misdemeanor. How do you get a felony DUI and what are the repercussions? Read on to learn the differences between a misdemeanor and felony DUI. While DUIs tend to fall under the category of misdemeanors, there are several situations in which the charges are elevated to felonies. Your first or second DUI will likely be considered misdemeanors, However, if you seriously hurt or killed someone while driving under the influence, then you will be charged with a felony—even if it’s your very first DUI. The state of Florida gets even stricter going forward, though. You could get charged with a felony on your third DUI offense if all three of your DUI convictions happened in the last 10 years. Your fourth and subsequent DUI offenses will always be charged as a felony, even if nobody was harmed or if your fourth offense occurred decades after your third offense. There are two types of felony charges you could face as a result of a DUI. 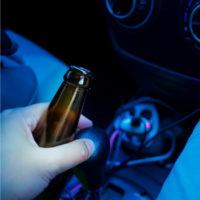 If you have had three DUIs in 10 years, a fourth or subsequent DUI or seriously injured someone while drinking and driving, then you will be charged with a third-degree felony. This is punishable by up to five years in prison and a fine of no more than $5,000. If you killed someone while under the influence, then the charge is elevated to a second-degree felony under Florida law. This charge could fall under DUI manslaughter or vehicular homicide. The punishment is up to 15 years in prison and a fine of up to $10,000. If you killed someone and left the scene of the accident, you could face even more prison time—up to 30 years. If you killed multiple people—even an unborn baby—you could face additional prison time as well. A DUI conviction can lead to hefty fines, prison time and a suspended license. On top of that, it will stay on your criminal record for a long time, marring your chances of future employment. Don’t wait to get the legal help you need. Following your arrest, you have only 10 days to avoid getting your driver’s license suspended. Call the Dade City criminal defense attorneys at Mander Law Group immediately so they can start working on your case and defend your rights. Schedule your consultation today by contacting us at (800) 557-0411.